The main job of liberals like Noam Chomsky, Amy Goodman, Keith Olbermann, Paul Krugman, and Michael Moore is to keep the liberals convinced that knuckle-dragging Republicans are responsible for everything that's wrong with America and that the solution is replacing them with intelligent Democrats. They seem to be doing a good job. On the other hand, the main job of Conservatives like Ann Coulter, Rush Limbaugh,Sean Hannity, Bill O'Reily, Mark Levin, and Michelle Malkin is to keep conservatives convinced that evil, God-hating Democrats are responsible for all that's wrong with America and that the solution is to elect good Christian Republicans. [i] Unfortunately for us, they too seem to be doing a snow-white job – or a white snow job depending on one’s perspective. Ann’s recent hit piece on Ron Paul in her Human Events article, Get Rid of Government, But First Make Me President, illustrates the extent to which these disinformers will bend logic and make fools of themselves in order to accomplish their purpose. “I don't think government should give us a license to get married. It should be in the church"
This is a classic non sequitur. Registering a marriage is different than granting a license. You can have a requirement to register a marriage without having a requirement to get a license. It’s just like having a baby. A license is not required to have a baby, but the law does require the birth to be registered after the fact. When a couple requests a marriage license, they are entering into a 3 way contract with the state. This is explicitly stated in some state laws and acknowledged in many other places. For example see the first page of the Family Law manual produced by the Ohio Bar Association below. Or read the anecdotal, and possibly apocryphal, conversation that Virgil Cooper had with a clerk in the Maricopa County courthouse in Arizona that explains the implications of the fact that a marriage license from the state makes the state a party to the marriage. All of the questions Ann Coulter raises about divorce, adoption,inheritance etc. were answered long ago. This country ran just fine for the first 250 years of its existence with the very situation she is mocking. Marriage licenses are relatively recent in history of the US, becoming commonplace only in the early 20th century. The absence of a state issued marriage license in no way prevents the state from requiring that prospective adoptive parents be a married man and woman. What’s more, eliminating the necessity of asking the state’s permission to marry in no way diminishes the ability of a married couple to establish that they are married. It can be established the same way any other contract is established. Below is copy of the 1856 marriage covenant from my great, great grandparents. It is not a state issued document and it says nothing about it being a license, but it’s proof based on multiple witnesses that they were married. In making irrational and ludicrous statements like: “Libertarians would be better off spearheading a movement to get rid of stop signs than to get rid of officially sanctioned marriage. A world without government stop signs would be safer than a world without government marriage." Ann is not only showing her us her juvenile reasoning ability, she is also, by implication,calling Blackstone a fool. According to my 1915 US edition of his Commentary on the Laws of England, Blackstone said of marriage, “Our law considers marriage in no other light than as a civil contract. The holiness of the matrimonial state is left entirely to the ecclesiastical law: the temporal courts not having jurisdiction to consider unlawful marriage as a sin, but merely a civil inconvenience. The punishment therefore or annulling of incestuous or other unscriptural marriages, is in the province of the spiritual courts which act for the welfare of the soul. And taking it in this civil light, the law treats it as it does all other contracts: allowing it to be good and valid in all cases, where the parties as the time of making it were, in the first place, willing to contract;secondly, able to contract; and lastly, actually did contract, in the proper forms and solemnities required by law.” [Chapter 15, §533,Vol. 1] Emphasis mine. The editor of the edition I have ( William Carey Jones, Director of the School of Jurisprudence, University of California ) says in the footnotes that “the law gives no action to the wife or child, directly, for any breach of the husband’s or the parent’s duty,” although it might punish a parent for neglect. In other words the state had no authority to interfere in a private contract unless there was a crime being committed. Under Rep. Paul's plan, your legal rights pertaining to marriage will be decided on a case-by-case basis by judges forced to evaluate the legitimacy of your marriage consecrated by a Wiccan priest -- or your tennis coach. she is exhibiting a shocking historical ignorance of the way our legal system operated for over 100 years. Biblically, marriages occur by the authority of the father of the bride and the groom. Having a minister officiate a ceremony was simply a reflection of the fact that people considered marriage a very important ceremony, and at important ceremonies it is proper to hear the Word of God (i.e. worship). And who better to bring that word than the pastor? When I marry people, I do not say, “By the authority vested in me by the state of Texas, I pronounce you husband and wife.” I simply say “I present to Mr. & Mrs. Jones.” The state of Texas has no Biblical authority to transact a marriage, although they do have authority to recognize people as being or not being in the state of matrimony. Who officiates the wedding is completely irrelevant to whether someone is married or not. Marriage is determined by two people entering into a marriage covenant on free and unconstrained vows. Of course, given the civil,ecclesiastical, and familiar importance of the union, those vows should be witnessed by at least 2 people, and preferably several more. Sec. 2.401. PROOF OF INFORMAL MARRIAGE. 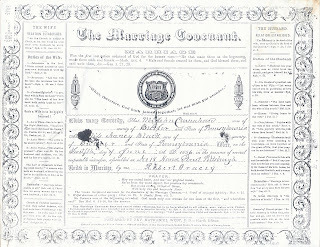 (a) In a judicial, administrative, or other proceeding, the marriage of a man and woman may be proved by evidence that the man and woman agreed to be married and after the agreement they lived together in this state as husband and wife and there represented to others that they were married. If one spouse decides he doesn't want to be married anymore, couldn't he just say there never was a marriage because the Wiccan wasn't official or the tennis coach wasn't a pro? According to current Texas law, the answer is No, they can’t. 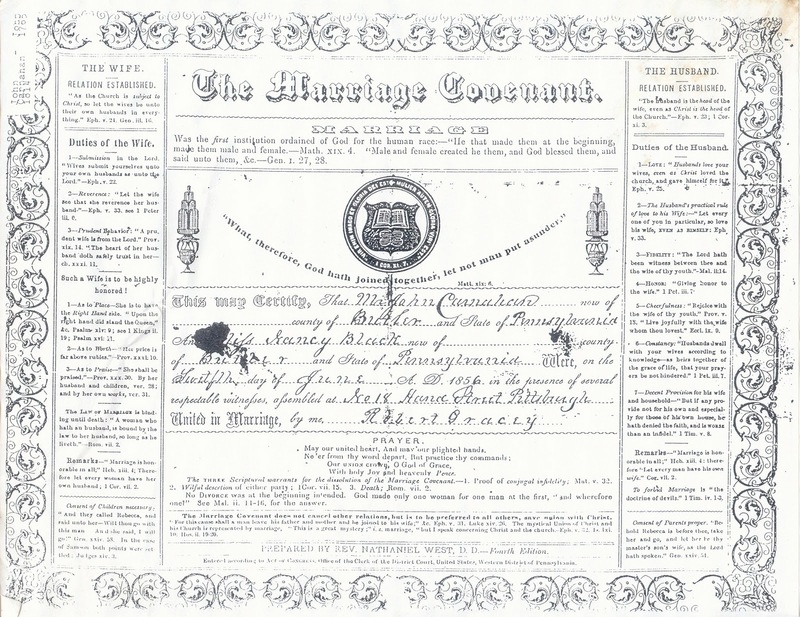 It always has been no, long before marriage licenses became popular. The Texas law at this point, and that of most other states, has nothing to do with marriage licenses. As a lawyer herself, Ann Coulter, Esq., should know this. Under Paul's plan, siblings could marry one another, perhaps intentionally, but also perhaps unaware that they were fraternal twins separated and sent to different adoptive families at birth-- as actually happened in Britain a few years ago after taking the government-mandated blood test for marriage. This is merely fear mongering as current government marriage license laws could not prevent this from occurring. There are reasons we have laws governing important institutions, such as marriage. As in landscaping, you don't remove a wall until you know why it was put there. I am afraid she’s the one who is historically ignorant about marriage laws. Ron Paul is simply advocating a return to what used to be the law. Although marriage licenses existed in the 19th century for blacks who wanted to marry, because that was otherwise against the law, the state of Texas did not start tracking these licenses until 1968. I think it is still safe to say that state marriage licenses are a relatively recent thing. Advocating their elimination can hardly becalled a radical, foolish, or ill-conceived idea. In fact, I rather like theidea. Maybe those Libertarians are so bad after all. [i]That’s basically the opinion of Cuban Servando Gonzalez as expressed in his recentbook, Psychological Warfare and the NewWorld Order, p255.